Srinagar: A three-hour train ride from Baramulla to Banihal in north Kashmir in peak winter, when the ground is covered with thick, white snow, is a sight that would make any picturesque location around the world appear bland, say people who have been on this train at this time of the year. 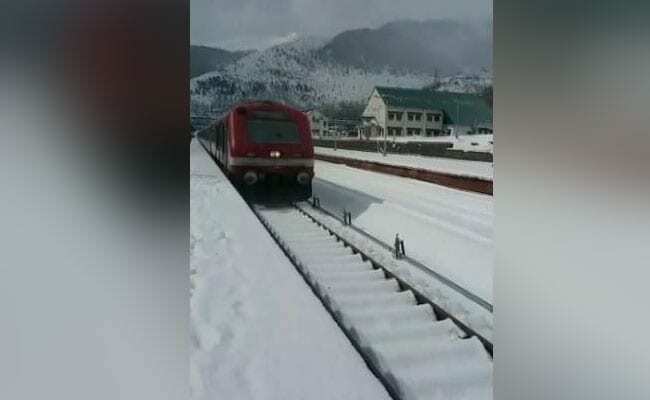 A video of the Baramulla-Banihal train racing down the tracks on a snowy valley surrounded by icy mountains in the distance has become a talking point on social media, with even Railway Minister Piyush Goyal praising the Indian Railways for keeping the trains running even in the harsh environment. South African cricketer Jonty Rhodes is another public personality who has taken note of the Indian Railways' prompt answers to queries by travellers. I have been a few times to snowboard in Gulmarg; does this mean that I can take a train from Delhi to Srinagar with my family this winter, sir? The three-hour ride from Baramulla to Banihal passes through some of Jammu and Kashmir's most beautiful landscapes, from hills covered with snow to wintry trees swaying gently in the wind, before the train enters a 10-kilometre-long tunnel at Banihal. "Kashmir is a paradise, and everywhere there are glimpses of heaven. It is so beautiful, these mountains covered under a blanket of snow," said Sajad Bhat, a teacher who took the train. With heavy snow blocking the main highway in winter, this train is extremely popular among travellers; it cuts travel time, is safer and keeps Kashmir valley connected with the world outside. "I always use this train for travelling. It saved time," said Rafat, a student who was going to Punjab. The train indirectly provides employment to many people in the area as taxi drivers and small shops cater to passengers. "Some 300 taxi drivers depend on Banihal railway station for regular work. Our business and livelihoods are tied to this station," said Rashid, a taxi operator at Banihal.